The BMAS has always had a presence in Cheshire, ever since the first administrator ran the Society office from her garage in Warrington, back in the 1990s. 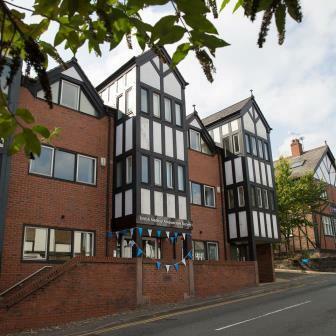 In 2003 the current property was purchased at 3 Winnington Court, Northwich and named BMAS House. The administrative functions of BMAS have been run from this office ever since and there are currently 4 members of staff working there. Northwich lies at the junction of the rivers Dane and Weaver and the area has recently undergone an £80 million redevelopment. It is ideally situated for the M6 and M56, Manchester and Liverpool airports and has excellent rail links from Manchester and London. In 2013 BMAS purchased the offices next door and the two buildings were joined to provide a large training space, meeting/breakout rooms, dining room and kitchen. Disabled access was improved and the building now has wheelchair access. There is also plenty of car parking available at the rear of the building. In May 2014 the first BMAS course was held there with the building being completed and officially opened by the town Mayor in September 2014. The BMAS courses, previously run in the North of England, are now run at this new venue and at a much lower cost to the Society than previous Northern courses. Students rate the location and facilities very highly and this development of the building has allowed the Northwich staff to become much more involved with members of the Society when they attend courses. BMAS Council meetings are now also held at the new facility twice a year.